But April June and I are heading for New Mexico with the horses, next week, a trip for pleasure, mo obligations to speak or sig, which I enjoy actually but it is exhausting. I love this picture. 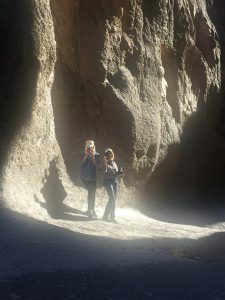 This is June and Evelyn in Close Canyon, Big Bend State Park. I didn’t go this year (this was in February). You have to walk the canyon, and people pile up rocks in the most creative way. The year I was there we made angel statues. A very mystical place, love it. 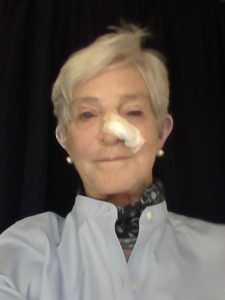 This is me after with basal cell carcinoma surgery, one week ago. Another reason I haven’t got things done. Very small but haven’t played with the group in front of people with this dressing on my face. I am now down to a Band-Aid. Back to the pennywhistle. Next song to learn, ‘The Lonesome Boatman’. 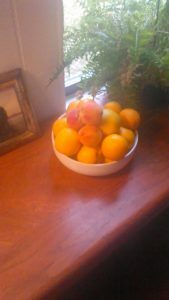 Home-grown fruit! Went to Fiesta with my stepson and daughter-in-law and granddaughter and her husband and grandson and in fact almost the entire Johnson family and affines, in San Antonio, where they had an orange tree in the front yard and sent me home with a sack full. We sat up most of the night and drank and talked. This is the civilized way to celebrate fiesta in San Antonio. Different from commercial — more rind, less pulp, sweeter. Then the neighbors here gave me homegrown peaches — sweetest fruit I have ever tasted. These are my neighbors down the road, He is a hunter on one of the big ranches and some people he took out to hunt turkey misfired and shot him in the face with #7 bird shot. He went in today to have the last of the pellets removed. I am sure the peaches will be consoling. A very nice guy. So I went down to take them some oranges and both he and I had big bandages on our faces. Something in the air. This entry was posted in News on May 3, 2018 by admin.